Kent v. Theo – Threatened Legal Action! – Kent Hovind v. Robert Baty – The Great Debates! Home→Kent v. Theo – Threatened Legal Action! 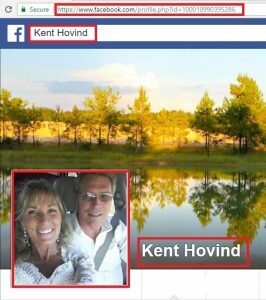 Today, June 23, 2017, Kent Hovind is threatening legal action against Theodore Valenzuela/Valentine, civil and/or criminal. Even though nothing was said that is wrong or out of place at our meetings it was wrong as well as illegal for Theo to secretly record and then make public the staff meetings without the knowledge and consent of all present. He has to know that. He is obviously FRANTIC to find anything he can slander us to gain popularity and views for his new “ministry”. He has violated scores of Scriptures starting with one of the Big Ten – thou shalt not bear false witness. How he can twist people’s words, cut and paste unrelated thoughts and add eerie music and silly pictures to make his stupid You Tubes and “documentaries” without his conscious bothering him makes me doubt his sanity or salvation or both. Ppl who know me well (like Ernie 28 years) or Lady Di at the camp (14 years) will tell you that I don’t lie and that I’m not building anything for my benefit or glory. I have served my Lord as best I can for 48 years and just want to please him. Theo is just trying to make a name for himself but is instead making a fool of himself big time and possibly facing fines or jail time for slander and other violations of law. Plz copy of all his stupid YouTubes about me before he takes them down so they can be used as evidence at his upcoming trial. I’m in Wisconsin now to speak at a youth rally and won’t be home before he gets served. 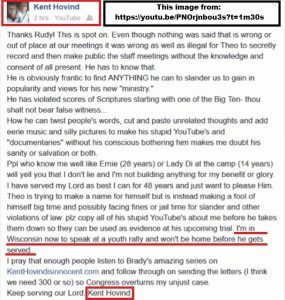 I pray that enough people listen to Brady’s amazing series on KentHovindIsInnocent.com and follow through on sending the letters (I think we need 300 or so) so Congress overturns my unjust case. Graphic of Kent’s message transcribed above. I believe the message has since been deleted from Kent’s FaceBook page indicated. 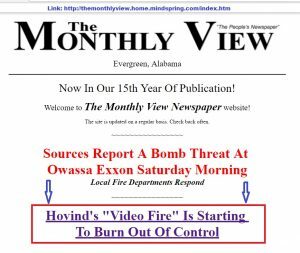 See following article on this site for my outstanding challenge to Kent Hovind to discuss his false legal narrative and other related matters. Kent continues to refuse to face me and deal with these matters even while continuing, as he promised, to promote his false legal narrative until the day he dies unless the Government gives him what he wants. The issue Kent has said is fundamental to understanding his legal problems is reflected in the graphic below and at the top of this site’s pages. details; perhaps because of his consciousness of guilt.